We were inspired by this picture in the beautiful photo gallery of Chicken Fried Gourmet, a blog featuring the cuisine of Shreveport, Louisiana-based chef Michael O’Boyle. In addition to adding new flavors to pasta, piling on some greens is a way for the Greens Police to get the family to eat more (or any) greens. Greens tossed in sauce and sprinkled with cheese go down more easily with the resistance. 1. BOIL. Cook ravioli, tortellini or a favorite pasta shape, along with your favorite sauce. You can use a red sauce, white sauce, clam sauce, or simply olive oil. 2. SAUTE. While the sauce is heating, lightly sauté baby arugula, beet greens, collard greens, mustard greens, spinach, chopped chard, kale or a mixture. 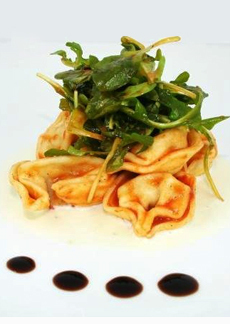 Tortellini topped with baby spinach. Photo and concept courtesy ChickenFriedGourmet.com. 3. TOSS. Drain the pasta and toss it in the sauce. Reserve some of the sauce and separately toss the sautéed greens in it. 4. GARNISH. Top the pasta with a layer of greens. Serve with grated cheese. Let us know how you like the recipe, and any tweaks you devise. Check out all the types of pasta in our delicious Pasta Glossary.